Healthcare, Manufacturing, Construction, Education, and General course packages make it easier to satisfy federal and state regulatory compliance requirements. An effective employee training program is key to creating a safe, compliant workplace. For many companies, on-demand training is the perfect alternative to traditional training methods – which can be overly costly and time-consuming. Using a flexible, easy-to-use online interface, on-demand training can improve efficiencies for both trainers and trainees, and can be implemented as a stand-alone solution or as part of a larger blended training strategy. With our Workplace Training Industry Packages, it's never been easier to implement an on-demand training program that's right for your business. Simply choose from our Construction, Manufacturing, Healthcare, or Education packages – each made up of 10 courses carefully selected to meet the needs of four specific industries – plus a General Package that covers cross-industry training essentials. And if you need more than the 10 pre-selected courses in your training program, we can tailor your package to include additional selections from our extensive course list. See our Course Library for a full listing of nearly 100 expert-reviewed courses. Our Workplace Training Industry Packages give you full administrative controls to a powerful Learning Management System, complete with customizable training options. Our on-demand workplace training solutions give you the ability to train one or all of your employees, using a flexible, easy-to-use online interface to schedule, deliver and manage training, as well as track the certification of completed courses. Now, you can deploy effective and compliant training to your employees, based on your budget, your needs and your employees’ time constraints. We believe that maintaining compliance with DOL, OSHA, EPA and other federal and state regulatory requirements, coupled with a successful training program, can help you lower costs, reduce injuries and prevent accidents. Manage your complete training program online with our robust hosted solution. Our Industry Packages give you the power to manage all of your online, virtual and classroom training activities with automated tracking and reporting based on the goals and parameters you set. You control every aspect of your training program through one easy-to-use, centralized application. 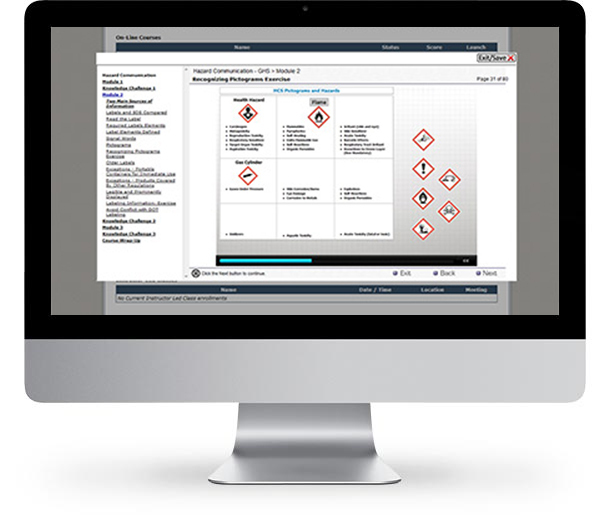 You get access to the 10 courses in your selected package, and we can customize your package to include additional courses from our library of 100 expert-reviewed workplace safety topics. We also provide online development tools that make it quick and easy to customize your training program, develop your own content, import legacy content from third parties, and add job-specific or organization-specific policies, SOPs, manuals, diagrams, and more. Creating and managing a top-quality training program to achieve your business objectives couldn’t be easier. It’s on-demand training in a scalable, fully-hosted environment. Call Us Now: 1.888.362.2007 . One of our experts will help you create a solution to meet your compliance needs. Outside the U.S., dial 1.312.881.2000.